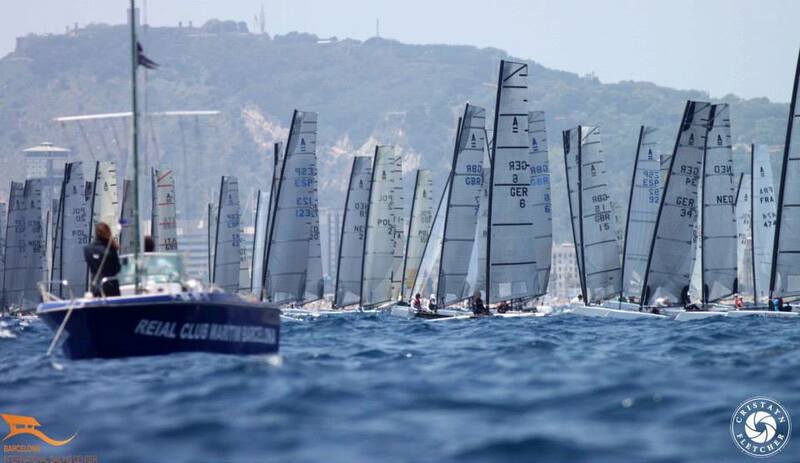 "Piet his report on day 2 of the Europeans in Barcelona. We thank Piet for his effort to write this reports and keep us updated on the situation at the regatta. Today the prediction was light wind from the south. It turned out to be north first and turning in the course of the day to south- east. When we went on the water it was easterly and slowly turning south. The course was set and the waves were increasing again. Also the tide was there but due to the angle of the starting line it was not so much of an issue as yesterday. This did not stop the major over the line in the first race. 1 attempt was taken to get the fleet away and the black flag was drawn. This did not stop a number of sailors to get on route too early so again a general recall. The 3rd we were clear. The waves were building again with the pattern from 3 directions which made a lumpy sea. This favoured the heavier guys, with the exception of Steve Brewin, who made a 1rst and second again. With the sea and the wind pattern a lot of top sailors were having all sort of problems, from failing trapeze like Chris Field who had also trouble yesterday from an Italian hitting him on the starting line, and Landy having a problem with the traveller track handicapping him. PJ could not get the J-boards out yesterday when returning to the harbour breaking one and had to capsize the DNA to get the other one out. The second race was a repeat of the first again with 3 start attempts. Lumpy sea and dropping wind made it harder to push through."